This Bunny playing with the snow, reading books and feeding birdies. Of course there is a full set of coordinating seamless patterns with a PAT file for Photoshop. Also in this bundle: patterns, 6 bunny illustrations, wreaths, card templates etc. 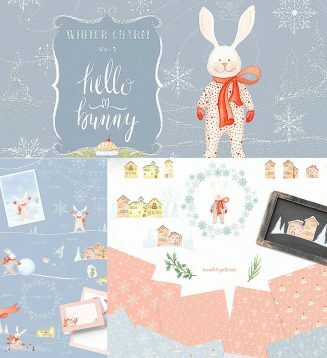 Tags: bunny, Christmas, greetin card, house, pattern, scene, snow, snowflake, watercolor, winter, wreath.